Headstones With Kerbs surrounds memorials are only allowed in certain cemeteries and have regulations regarding the size. The Headstone Surround can vary in size from a single plot up to an 8 plot graves. Nearly all cemeteries have their own strict guidelines on the type of surround, or if any that should be used. These regulations are all taken into account by our vastly experienced Monumental Mason and by our dedicated team staff. 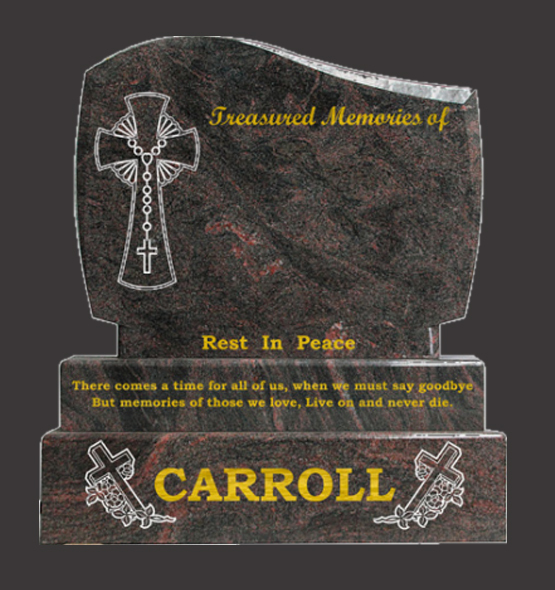 All Headstone Kerbed memorials are erected on a suitable foundation with reinforced steel and depending on the fall of the ground by our vastly experienced and dedicated team. We also have expertise in bespoke creations of kerb memorials. If you have seen one you like elsewhere, please give us the details and specifications and we will design and manufacture a similar one for you. There different types of Kerbing and corner posts for your grave surround that will compliment your headstone design. Cladding/Plinth is an extra feature for the outside of the grave surround that enhances the overall look of the grave plot and makes it easier to maintain over the years.